I have 3 related questions about playing the lowest notes in tune. As I understand it, the lowest notes are constructed a little sharp, to compensate for the pervasive poor embouchure that most of us have. Since Sir James has such a good embouchure, this compensation in flute construction results in the lowest notes being a little sharp, which Sir James further corrects by drawing out the foot-joint by about 2mm. This surely means that any alternative method (further manipulation at the embouchure) is the wrong thing to do. Now in my practice, at first I thought my flute was in tune as I played these notes, but as I focussed on how I played the lowest notes I realised that I was dropping the lower jaw slightly. This was in part my attempt to increase the cavity of the mouth, and keeping the tongue low and flat, for better tone and resonance, but perhaps it causes the pitch to drop. In that case I am getting the sharp notes back in tune but perhaps by the wrong method. If the jaw drops, the lips must follow, which doesn't seem a good idea. 1. Is this the usual mistake/problem? 2. Is it correct to say that the jaw should ONLY move forward and backward according to register and intonation (with adjustment of the upper lip to direct airflow more down into the flute)? 3. Can the jaw be dropped in special circumstances (eg searching for special tone colours)? Have I misunderstood the whole issue? I would be grateful for clarification on this. Normally flat low notes are the most common despite the make or brand of the flute, because most flute students slow the air speed down in order to get the low notes to speak. They slow the airspeed down too much (10 mph for example), so that they can play low without overblowing or squeaking up the octave. For intermediate and advanced flutists, having a new scaled flute with a sharper set of low octave Right Hand (RH) notes can be a challenge at first, as they may have to pull their upper lip downard to blow at a downward angle when blowing forte on low notes to keep them well in tune. Keep this idea of pulling down the upper lip firmly in mind when playing without anything to tune to. You can blow at 100 mph (miles-per-hour air-speeds are, of course imaginary) on a low C and play in tune if your upper lip pulls down, and presses the lower lip and the lower teeth downward in the process. I suggest using the Tuning CD and being aware of what dynamic you're playing at. Soft low notes may be flat, loud low notes may be sharp. Mezzo forte low notes should be right on pitch. Staying accutely aware of your dynamic when using a tuning source is important, and often forgotten during practise. A.: Since Sir James has such a good embouchure, this compensation in flute construction results in the lowest notes being a little sharp, which Sir James further corrects by drawing out the foot-joint by about 2mm. This surely means that any alternative method (further manipulation at the embouchure) is the wrong thing to do. I've heard of flutists pulling out the footjoint a millimeter or two in order to compensate for a sharp RH low register. Apparently this varies from flute to flute and from brand to brand. Obviously an advanced player can try this and see whether it helps. A few years ago one of our online flute teachers here at GFC spoke to a Yamaha rep. who quietly mentioned that an A-442 Yamaha flute was really capable of being played from A 443 to A 445 and was, in fact, made to do so. If a flute like this had the footjoint pulled out 2 mm. that might indeed help. "by drawing out the foot-joint by about 2mm. This surely means that any alternative method (further manipulation at the embouchure) is the wrong thing to do." But how much is TOO MUCH manipulation? I believe that the soft tissues are the ones best manipulated as they are very quick to respond (the muscles that surround the lips are manipulated in order to reposition the lips as required.) Afterall the soft tissues used for eating, speaking etc. respond much quicker and without any fatigue or unnaturalness. This is something Paul Edmund Davies spoke about in one of his masterclasses; if you don't press the flute hard into your chin, but instead, release the pressure on the chin when going for a high note, the air angles upwards naturally from just the soft tissues of the chin and lips. I think the goal of great tone and evenness of sonority is best sought by STARTING tone work in the low register and solidifying an easy comfortable and natural jaw position as the starting point. Then, as you gradually ascend to work on tone in the middle and finally (much later) the high register, you will continue to keep your jaw in a comfortable and "normal", functional and easy position. Doing tone work along with a drone, such as The Tuning CD makes it all become so much easier to multi-task and find all the variables. You can even work upwards from or downwards to the low register eventually, but I would keep the BASIS of the embouchure consistent with what was easiest, best and most resonant and full in the low register. You should not have to overwork the jaw to play only the low register in tune with good tone. The jaw should be relaxed and natural at all times to avoid fatigue and strain. If a student begins tone work with the jaw in any kind of tight or tense position (jutted forward for example) they can eventually develop TMJ (jaw hinge pain) as the jaw cannot be thrust forward and backward with tension/precision etc. without causing fatigue, especially once you start leaping large intervals or sustaining long passages with multiple dynamics etc. Now in my practice, at first I thought my flute was in tune as I played these notes, but as I focussed on how I played the lowest notes I realised that I was dropping the lower jaw slightly. I noticed this method several years ago as a terrific trick to drop to soft low notes when otherwise playing in the middle or high register. When you open your jaw suddenly (drop your lower teeth) the lips follow in response to the lowering of the teeth, and the lip aperture opens slightly. When the lip aperture opens minutely, the air speed naturally slows (larger passageway = slower air speed). When the air speed drops, the low notes are more likely to sound. This is great to know when you have to keep popping down to soft low notes. Even the smallest opening of the lip aperture slows the air-speed down from let's say 80 mph to 30 mph. This is enough to pop out a soft low C or low D on demand, and much easier than deliberately changing the air-reed angle or TRYING to blow softly for a single note in rapid 1/16th note Baroque-type passages. follow, which doesn't seem a good idea. As I say above, this is a useful technique to use for when you need a quick soft low note in a passage that is mostly written in the middle or high register. However, if the low note is flat, perhaps you are also accidently blowing too slow and air speed (flattening the pitch of the low note) and/or also angling downward. You don't need to blow that softly, nor angle downward at all to use this technique, but again, it is only a technique that is for some pieces, and some large interval leaps. If the low note is sharp, then let me know, and I'll search for more further solutions. A.: 2. Is it correct to say that the jaw should ONLY move forward and backward according to register and intonation (with adjustment of the upper lip to direct airflow more down into the flute)? Does the lower jaw in fact slide easily forward and backward?? It SEEMS to be able to do so, if you jut it forward like a barracuda or piranha fish, placing your bottom teeth in front of your top teeth, you will feel the straining at the hinges which is the most damaging jaw hinge action you could possibly do....but do it for a minute. Feel the strain? Now millimeter by millimeter, allow your lower teeth to unhook themselves from the upper, and still in a semi-closed chewing position, gradually, slowing slide back from in front, to meeting the upper teeth tip to tip, then to 1 mm farther back, 1 more mm farther back until finally your teeth are at rest, lower teeth in the normal chewing position. Feels much more natural and comfortable right? So why force the lower teeth forward at all if you could achieve the same air angling using the soft tissues of the lips instead? Yes, sliding the lower jaw forward seems to work for flute players at first, as it raises the angle of the airstream for high register playing, but it is the least efficient possible manner of raising the airstream and the most wearing on the tissues being used. So why does anyone ever advocate it? They THINK that shoving the lower jaw forward and back is giving them more control, but it's an action that is being misnamed. Kujala covers this in his three part article called "Jaw Boning". What he has seen from looking at the skeleton of the jaw hinge is that if you open your teeth, the lower jaw swings downward and BACK as it descends. This is the nature of the way the jaw hinge is built. The more you lower your lower teeth, the farther back your chin recedes. Likewise, when you raise your lower teeth, as if to chew, your chin naturally follows an arc and presents as more forward. This action is very natural and easy and strains nothing. It is the normal opening and closing of the teeth that in turn, manipulates minutely the soft tissues of the mouth area. Nyfenger also states the same thing in "Music and the Flute"; the jaw hinge is designed for chewing, not for sliding forward. His book is WELL worth reading for the three or four brilliant pages on this very topic. 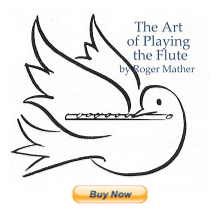 Roger Mather has also stated this in "The Art of Playing the Flute". You simply keep the jaw open, natural and in its most easy position at all times, and if you need to close the teeth very slightly for various effects (thin, distant tone, soft-diminuendos, etc.) you simply gradually close the teeth and the effect takes place in the sound. This opening and closing,natural mouth-use method also does not adversely affect intonation and is very easy to repeat or do quickly, without fatigue. 3. Can the jaw be dropped in special circumstances (eg searching for special tone colours)? Have I misunderstood the whole issue? I would be grateful for clarification on this. I believe that the most OPEN tone quality is from having the jaw open and released at the hinges. Often the tone you want to work on the most is the singing, open, well supported, centered tone quality and for this, having a loose and open jaw is very key. It makes a resonant 'cathedral' out of the mouth space, and releases the root of the tongue from interfering with air flow, and from causing tightness in the throat. Later, when practising music that demands soft pianos, pianissimos, tapers, diminuendos etc. you will find that the lower teeth can be raised slightly, and/or the front of the tongue can be used as a valve inside the mouth to create faster airstream to keep pitch up when playing softly etc. See videos below. But each feature that you later add on will be added to an easy and released jaw hinge. Any tension at the jaw's hinge is cumulative and can create pain and TMJ over the longrun. I know, because I was wrongly taught to do this when I was 18 or so. Avoid the pain of TMJ. Trust me. Hope this helps, and I have here the specific Kujala "Jawboning" article which specifically talks about how to use the jaw for dynamics. In brief, Kujala uses the acronyms FULP and PLOT. FULP = for Forte playing - the Upper Lip Pulls downward. This in turn causes the upper lip to push the lower lip downward. This lowers the pitch simply and effectively for loud playing with fast air speed. PLOT = for Piano playing - LOwer Teeth rise upward. This in turn pushes the upper lip upward. This raises the pitch simply and controllably for soft playing with a slow air speed. Hope this helps, sorry it's so long. But I've covered 90% of everything I've discovered. Wish more teachers knew about this stuff; so very important!! VIDEO Spit-Buzzing 101; the basic 'how to buzz' information. All the best, and I apologize for the longwindedness...doh! I absolutely love this! This was so helpful in helping me understand how to properly achieve a more open sound; as well as to watch for and avoid any unnecessary, and potentially distructive jaw movement. Your anaology of "making a 'catherdal' out of my mouth space" has helped me considerably! Also Thank you for explaining Kujala's FULP and PLOT, your post has shed so much light on subjects that are really never discussed with me. Putting your jaw back is the same as covering less of the flute's blow-hole with your lower lip. So instead, start with your jaw normal, and roll the flute out and down so that it's rolled out on your chin. Then your lower lip will cover the blow hole less. Then, instead of moving your jaw, when you want to play from low to high, move your lips forward and off your teeth. As the lips move forward, the lower lip covers the blow hole gradually more and more. When you play low again, make sure to move your lips back, but leave the jaw the same. This is better explained by a live flute teacher in your lesson, as there are many parameters you might not know about yet.